Marbella property shows us how it's done. Marbella is proving them wrong! 2013-2014 saw some of the toughest times for selling real estate across the whole of Europe, as people's money started to drop, the first thing that everyone stopped buying was property... or so they thought. 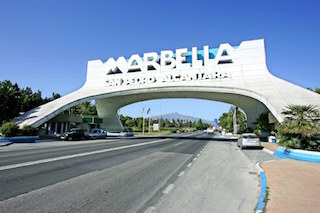 New research has shown that Marbella, situated in the Malaga province not only survived the Credit Crunch, but thrived with home purchases in the area rising by 89% compared to areas all around that dropped or dwindled! So why is this? Firstly, 85% of properties sold in this region are sold to expatriates, mainly coming from Germany, England, Russia and France which means that people are more than happy to use their own life-savings for a property, where they would usually just wait for a bank rolled mortgage if staying in their own country. However, the most exciting statistic shows it's not WHERE the people were coming from, it's the type of property they're buying! At the end of the year, sales of luxury apartments and villas have risen by 77% which is way ahead of other locations in the country and these larger, designer properties, which come with a higher commission percentage/charge for Real Estate Agents have kept the money flowing and the property ladder moving. So much so that sales of UltraIT's systems in the area also kept rising as more estate agents chose us to provide a practical and secure system for managing their properties. Sales have continued to rise in the Costa del Sol town and are shown to be selling 15.8% more properties compared to Spain's average of just 2%. Just three houses short of 4000 sold last year have meant that the property bubble shows no sign of bursting with more cash and interested parties being pumped into it. However it's the high cost of the luxury accommodation that is really causing Real Estate Agents to flock to the area, and using our pay-as-you-go systems, you can manage and edit these larger properties at the touch of a button, plus you can add large numbers of high quality photos to keep the prospective clients interested. According to one of our luxury property agents which has been specialising in high-end properties since the 1970's, it's seen a rapid and constant evolution due to the high influx of tourists, yet despite all this, the property prices in the area have shown no sign of peaking. A recent study compared property prices in London to the affluent Spanish coastline to see exactly what you got for your money and the comparisons were shocking! Whilst 1 million pounds in the UK could get you a two bedroom flat in Vauxhaull, an eight bedroomed, beachside property with a pool spread out over three stories could be yours for the same money. Stretching to 1.8 million in the same area, you could squeeze in another bedroom in Kensington, or splash out on a 13 roomed (each with en-suite) luxury property on the Spanish coast with multiple garages, games room and even a cinema! Like the different sized houses, choosing UltraIT over other competitors will give you much more for your money. Our Real Estate Agent services can make your life so much simpler whilst giving you the peace of mind and security needed to run a business in the 21st Century. Our bespoke packages allow you to pick and choose exactly what you want whilst giving you the opportunity to grow and expand into any area you wish. Contact UltraITnow for your no obligation quote! The next luxury property sold could have your name (and commission) all over it.